Introduction Effective management of seasonal and pandemic influenza is a high priority internationally. Guidelines in many countries recommend antiviral treatment for older people and individuals with comorbidity at increased risk of complications. However, antivirals are not often prescribed in primary care in Europe, partly because its clinical and cost effectiveness has been insufficiently demonstrated by non-industry funded and pragmatic studies. Methods and analysis Antivirals for influenza-Like Illness? An rCt of Clinical and Cost effectiveness in primary CarE is a European multinational, multicentre, open-labelled, non-industry funded, pragmatic, adaptive-platform, randomised controlled trial. Initial trial arms will be best usual primary care and best usual primary care plus treatment with oseltamivir for 5 days. We aim to recruit at least 2500 participants ≥1 year presenting with influenza-like illness (ILI), with symptom duration ≤72 hours in primary care over three consecutive periods of confirmed high influenza incidence. Participant outcomes will be followed up to 28 days by diary and telephone. The primary objective is to determine whether adding antiviral treatment to best usual primary care is effective in reducing time to return to usual daily activity with fever, headache and muscle ache reduced to minor severity or less. Secondary objectives include estimating cost-effectiveness, benefits in subgroups according to age (<12, 12–64 and >64 years), severity of symptoms at presentation (low, medium and high), comorbidity (yes/no), duration of symptoms (≤48 hours/>48–72 hours), complications (hospital admission and pneumonia), use of additional prescribed medication including antibiotics, use of over-the-counter medicines and self-management of ILI symptoms. Ethics and dissemination Research ethics committee (REC) approval was granted by the NRES Committee South Central (Oxford B) and Clinical Trial Authority (CTA) approval by The Medicines and Healthcare products Regulatory Agency. All participating countries gained national REC and CTA approval as required. Dissemination of results will be through peer-reviewed scientific journals and conference presentations. Trial registration number ISRCTN27908921; Pre-results. Antivirals for influenza-Like Illness? An rCt of Clinical and Cost effectiveness in primary CarE (ALIC4E) will be the first publicly funded, multicountry, pragmatic study determining whether antivirals should be routinely prescribed for influenza-like illness in primary care, and if prespecified characteristics (age, symptom duration, illness severity and comorbidities) influence outcomes. The platform design allows the study to remain relevant to evolving circumstances, with the ability to add treatments arms. Response adaptation allows the proportion of participants with key characteristics allocated to study arms to be altered during the course of the trial according to emerging outcome data, so that participants’ information will be most useful, and increasing their chances of receiving the intervention that will be most effective for them. Since the possibility of taking a placebo influences participant expectation about their treatment and determining effects of the interventions on patient behaviour in real-world care is critical to estimates of cost effectiveness, ALIC4E is designed as an open-labelled trial. The open design carries risk of bias in participants’ self-reported outcomes; clear explanation of equipoise by recruiters may mitigate this. Currently, the most suitable antiviral agent available for pragmatic evaluation in Antivirals for influenza-Like Illness? An rCt of Clinical and Cost effectiveness in primary CarE (ALIC4E) is oseltamivir (Tamiflu), a neuraminidase inhibitor (NI). The US Food and Drug Administration approved oseltamivir in 1999. Oseltamivir was classified by WHO as an essential medicine until 2017,9 10 and many countries have stockpiles of the drug to ensure it is readily available to treat seasonal and pandemic influenza.5 Oseltamivir could therefore be used for the management of ILI on assumption that many cases of ILI may be caused by influenza, the probability of this being higher during confirmed periods of heightened influenza based on national reports of ILI consultations and laboratory-confirmed influenza cases. Since 1999, oseltamivir has generated sales in excess of US$18bn (£11bn; €13bn). The USA stockpiled 65 million treatments at a cost of US$1.3bn. The UK spent £424m on a stockpile of 40 million doses. By 2009, 96 countries possessed enough oseltamivir for 350 million people.18 In 2017, WHO downgraded oseltamivir in the list of essential medicines from a ‘core’ drug to one that is ‘complimentary’—a category of drugs considered less cost-effective.9 10 However, there has never been a large-scale, international, publicly funded, pragmatic randomised controlled trial (RCT) of its cost-effectiveness in primary care, and so the evidence base either to support or not support the routine use of this agent in primary care is inadequate and raises the question: does the effect found in previous efficacy studies translate into a meaningful benefit in every day primary care? Specifically, what are the overall costs and benefits of this possible shortened symptom duration from the perspective of the individual sufferer, the health services and for society? Do patients considered to be at higher risk for complications of influenza (for example, due to age, duration and severity of symptoms or relevant comorbidity) benefit more from antiviral treatment in primary care? Answering these questions will reduce important clinical uncertainty for primary care clinicians about whether to prescribe antiviral agents for ILI and whether or not to prioritise antiviral treatment for subgroups of primary care patients. The ALIC4E trial will be delivered as work package 4 of the Platform for European Preparedness Against (Re-) emerging Epidemics (PREPARE: www.prepare-europe.eu/) consortium grant. PREPARE is a European Commission funded network for the rapid and efficient delivery of harmonised, large-scale clinical research studies on infectious diseases.19 ALIC4E will be an RCT of investigational medicinal products in primary care that will determine the clinical-effectiveness and cost-effectiveness of adding antiviral agents to best usual primary care for patients with specific characteristics suffering from ILI, and thus enable clinicians to better individualise prescribing decisions. The primary objective of ALIC4E is therefore to determine whether adding antiviral treatment to best usual primary care is effective in reducing time taken to return to usual daily activity in patients with ILI. Secondary objectives will be to determine whether antiviral treatment is cost-effective; benefits prespecified subgroups of participants; decreases hospital admissions; decreases complications related to ILI, especially pneumonia; improves the health-related quality of life; decreases (repeat) attendance at the GP, or other health services, decreases time to first reduction, time to alleviation and new/worsening of ILI symptoms; reduces the use of OTC and prescribed medication, including antibiotics, and affects the self-management of ILI symptoms. The protocol for ALIC4E is reported according to the Standard Protocol Items Recommendations for Interventional Trials (SPIRIT) guidelines. All participants will provide written informed consent before participation. The study will be conducted (using Good Clinical practice guidelines) according to the principles of the Declaration of Helsinki and in accordance with other relevant national guidelines, regulations and acts. An independent Data Monitoring Committee will review efficacy and safety data by treatment allocation, and a Trial Steering Committee (TSC)will provide oversight of the trial. A manuscript with the results of the primary outcome will be published in a peer-reviewed journal. Additional manuscripts will report secondary outcomes and be submitted for publication in peer-reviewed journals. The relevance and necessity of the research question, study design and development of patient facing documents including the consent forms, participant information sheets, symptom diary, all follow-up forms and promotional materials have been reviewed by members of the public. The patient and public involvement group included a mixture of research experienced and inexperienced people, parents and elderly members of the public. As part of the TSC, a representative of the relevant patient group is involved in the continued review of the recruitment to and conduct of the study. A TSC meeting is held at least once per year before each recruiting season. The intervention arm in ALIC4E is the use of an antiviral in addition to best usual primary care. The burden to participants was assessed by the TSC and considered minimal as the only antiviral currently being assessed in ALIC4E, oseltamivir, is a licensed medication with marketing authorisation globally. In the context of the ALIC4E trial, a standard dose of oseltamivir has been shown to be well tolerated. The study itself is only using the standard dose of oseltamivir and is being used according to the marketing authorisation it has been granted. Trial participants will not be informed of the trial results directly. However, the results will be published on the PREPARE Consortium website (http://www.prepare-europe.eu/) and on the Nuffield Department of Primary Care website (https://www.phc.ox.ac.uk/phctrials), both can be accessed freely. ALIC4E is a European multinational, multicentre, open-labelled, pragmatic, adaptive-platform, RCT. 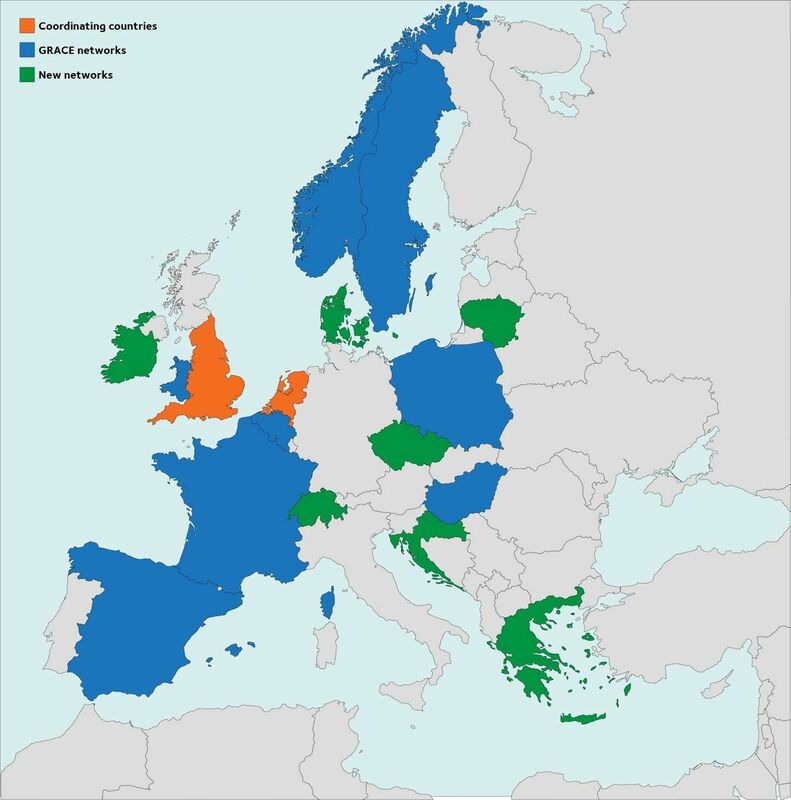 Twenty-one primary care clinical research networks in 15 European countries will recruit participants (figure 1), and each network will co-ordinate the recruiting sites within their network. A number of the primary care research networks had already established collaborations through the Genomics to combat Resistance against Antibiotics in Community-acquired LRTI in Europe (www.grace-lrti.org) Network of Excellence.20 21 They were sustained through Translational Research on Antimicrobial resistance and Community-acquired infections in Europe (www.esf.org/trace) and were complemented by PREPARE for ALIC4E with six additional primary care research networks. ALIC4E European networks. Coordinating centres are in Oxford, UK and Utrecht, The Netherlands. The ALIC4E recruiting networks include: Belgium (Antwerp and Ghent), Czech Republic, Denmark, France, Greece, Hungary, Ireland, Lithuania, Netherlands, Norway, Poland (Bialystok and Lodz), Spain (Barcelona, Catalonia and Santiago de Compostela), Sweden, Switzerland and the UK (Oxford, Southampton and Cardiff). ALIC4E, Antivirals for influenza-Like Illness? An rCt of Clinical and Cost effectiveness in primary CarE; GRACE, Genomics to combat Resistance against Antibiotics in Community-acquired LRTI in Europe. Recruitment will be over three consecutive influenza seasons, Q4 2015 to Q1/2 2018. Each season’s start and end of recruitment will be based on reports of local ILI incidence rising above (or falling below) prespecified thresholds, using information supplied by the European Centre for Disease Prevention and Control (ECDC)22 and local and regional sources for each network. We aim to recruit a minimum of 2500 participants through recruiting sites (GP practice, primary care out of hours (OOH) service or paediatric centres within primary care). Potential participants will be identified when they present to the recruiting sites with symptoms of ILI, or when they telephone for an appointment or advice about their symptoms. Participants must meet the inclusion criteria (including symptom onset of 72 hours or less) and have none of the exclusion criteria (table 1). The definition of ILI used in ALIC4E was based on the ECDC definition23 with flexibility to maximise recruitment of children and the elderly.24 25 If eligible and willing to participate, the participant will complete the rest of the initial trial procedures either within the same visit, or at a second appointment with a recruiter at the recruiting site, or at home. The local implementation of the trial has built-in flexibility, and local network recruitment processes vary. For example, medical students may assist with recruitment tasks in certain practices, whereas others will incorporate triage systems or additional trial-specific clinics and/or research support staff in their recruitment processes. Participants randomised to best usual primary care plus oseltamivir arm will be given a dose of 75 mg oseltamivir two times per day for 5 days by the oral route (capsules) for those ≥13 years. For those who are ≥1 year but <13 years, the doses will be two times per day for 5 days in suspension, administered orally, according to weight: 10–15 kg=30 mg, >15–23 kg=45 mg, >23–40 kg=60 mg and >40 kg=75 mg. Children weighing >40 kg and who are able to swallow capsules may receive treatment with the adult dosage of 75 mg capsules two times per day for 5 days as an alternative to the same dose of oseltamivir suspension. Route of administration, dosage and treatment periods follow the manufacturer’s summary of product characteristics.12 Weight will be measured in children ≤12 years during the recruitment visit for medication dosing. All other participants will be asked about their weight at the baseline assessment and measured in case of uncertainty. A daily symptom diary and subsequent day 14–28 telephone call will be used to monitor intervention compliance, and together with a telephone call after day 28, will also ascertain a minimal data set for some other outcomes. The primary outcome is patient reported time to having both returned to usual daily activity, and ‘fever’, ‘headache’ and ‘muscle ache’ symptoms all rated as ‘≤minor problem’. For non-verbal children, ‘clinginess’ will replace ‘headache’ and ‘muscle ache’, when both are unanswered. participant reported self-management and usual daily activities. Table 2 outlines the ALIC4E schedule of procedures according to the SPIRIT guidelines. Additionally, clinical examination findings will be recorded including: temperature and the way it was measured (oral, ear or axilla), use of antipyretics in the last 4 hours, pulse rate, weight (≤12 years or in cases of uncertainty), height, smoking status, gender and whether they have had influenza vaccination within 6 months and pneumococcal vaccination within 5 years. The recruiter will provide antiviral medication according to the participant’s group allocation and standardised instructions on how to take the medication. The recruiter will also take an oropharyngeal and a nasal swab (COPAN) from those <16 years and a nasopharyngeal swab (COPAN) from those ≥16 years. All swabs will be placed in 3 mL universal transport media and transported to a local laboratory for storage. Finally, they will instruct participants how to complete the symptom diary and give information about telephone follow-up assessments. There is no requirement for participants to attend a face-to-face follow-up visit as part of their study participation, as all subsequent measurements will be ascertained by self-completed diary-based questionnaires and through telephone calls from the local trial team. Participants (or their legal guardian or their carer) will be asked to complete a symptom diary from day 1 (baseline) to day 14 after randomisation. The following data points will be collected once: expectations of treatment benefit, ethnicity, employment status, cohabitation, pregnancy and stage and current long-term medication. The following data points are collected daily in the diary: severity of selected ILI symptom, quality of life (EuroQol Visual Analogue Scale (VAS)), return to usual daily activity, prescription medication use (including antibiotics), use of OTC medication or remedies, adherence to trial medication and potential side effects (up to day 7). The following data points will be collected weekly: quality of life (using EQ-5D-5L index (respondents >12 years) or EQ-5D-3Y (respondents ≤12 years)), effect of the participants’ symptoms on usual daily activities, healthcare resource use, out-of-pocket expenditure and ILI state of people in the same household. Participants and legal guardians will be telephoned on day 3 (±1 day) (with day 1 defined as the day they were recruited into the study) to offer support with symptom diary completion and to check for any urgent issues. They will also be telephoned on day 14 (up to day 28) and asked on what day they returned to their usual daily activity, if and when their fever, headache and muscle ache symptoms reduced to minor severity or less to ensure the primary endpoint is collected for all participants and to ascertain any serious adverse events (SAEs) in the preceding 2 weeks. Participants will receive a final telephone call on or after day 28 to complete a verbal EQ-5D-5L/3Y and VAS, to answer remaining questions about symptom resolution if needed and about their trial participation and consent process as part of a process evaluation (see below). The trial team will ask whether participants have had a recurrence of their symptoms during this time and whether they have been admitted into hospital as a result of their symptoms. Participants who have visited the hospital with complications possibly related to ILI and who have had a chest X-ray will have their primary care clinical records examined by the trial team for confirmation of relevant diagnoses of complications, including pneumonia. Once the swabs have been received at local laboratories, samples will be frozen and stored at −70°C (−20°C is acceptable if there is no deep freezer). After each influenza season, samples will be transported to the Laboratory of Medical Microbiology, University of Antwerp, Belgium for analysis. Each participant’s swab(s) will be analysed using a Multiplex RT-PCR for detection of pathogen genes by TaqMan technology to identify whether or not the participant is infected with influenza A or B, with other respiratory virusesii or with bacteriaiii. As part of the day 28 telephone call to the participants or legal guardians or carers, questions will be asked about motivation for participating in the ALIC4E study, what influenced that decision and questions related to research participation during a pandemic. All participating clinicians will be asked to complete a brief questionnaire, and a subsample will be asked their perspectives on the trial process, their views of influenza management in primary care and participation in pandemic research. Oseltamivir has a well-documented safety profile and is a commonly used medication in a primary care setting. As a result, no non-SAEs will be recorded in this study. All SAEs occurring during the 28 days participants are enrolled on the trial will be recorded. It will be left to the investigator’s clinical judgement to decide whether or not a symptom or side effect is of sufficient severity to require the participant’s removal from treatment. If the participant is withdrawn due to an adverse event (AE), the investigator will arrange for follow-up visits or telephone calls until the AE has resolved or stabilised or until the end of their trial participation, whichever is later. If the participant is withdrawn due to an AE, follow-up data will continue to be collected, and their information will be included for the purpose of the intention to treat (ITT) analysis. Participants have the right to withdraw from the study at any time without any prejudice to current and future healthcare. We chose an adaptive platform trial design because it provided flexibility to evaluate additional interventions in the trial, should interventions emerge that are suitable to pragmatic evaluation in primary care. Additionally, the design provides the ability to prospectively identify particular subgroups of interest that may receive benefit from antiviral agents, as opposed to estimating a single overall effect. This is done by incorporating a Bayesian modelling approach, combined with response adaptive randomisation based on prespecified participant characteristics. There will be multiple interim analyses during recruitment; planned after every 750 patients and/or between influenza seasons. In ALIC4E, participants will be initially randomised in a 1:1 ratio to the two arms, with stratification by subgroup and random blocks. Each arm will maintain at least a 10% probability of randomisation within each subgroup throughout the course of the trial. Arm superiority will be assessed by subgroup and may be declared superior in some subgroups, but not within others. If, at an interim analysis, an arm meets the superiority criterion for one of the treatments, randomisation probabilities may be modified for those subgroups such that a minimum of 10% of participants are allocated to the inferior arm, with the remaining allocation to the superior arm (a maximum of 90%, if two arms). In this event, stratification and blocking will no longer occur within these subgroups. This will ensure that the majority of participants receive the best-known therapy, yet the trial design will still allow the assessment of seasonal variation and population changes in the study population over time. In addition, we will still be able to collect data about costs and health-related behaviours (including healthcare seeking) associated with a poorly performing arm. New comparator arms may enter the trial as determined by the TSC. Eligible therapies will include newly approved treatments for ILI or therapies recommended by public health agencies during an influenza pandemic. If an arm is added to the trial, there is a prespecified algorithm determining randomisation ratios, and for activating response adaptive randomisation within subgroups to the respective treatment arms. The operating characteristics of the trial will be updated via simulation; however, the general structure of the trial does not change. Response adaptive randomisation may be activated in subgroups without satisfying superiority criterion only if the number of interventions is greater than two. A sample size calculation for the planned design is not available using traditional formulas. Instead, simulations must be used to estimate the operating characteristics of the adaptive algorithm, including estimates of how many participants with particular characteristics are required in order to detect differences in treatments. In these simulations, the prespecified algorithm will be applied such that the randomisation of participants with particular prespecified characteristics will depend on the number of arms and the collected outcome data. In addition, the algorithm will determine when arms are dropped for futility, when an intervention is declared superior, and will have a process for adding a new intervention to the platform trial. Between 2500 and 4500 participants will be recruited during three consecutive winters. This range has been chosen to ensure sufficient power for comparisons in the overall population, as well as within the prespecified subgroups. Given the nature of the study’s adaptive design and the desire to ensure sufficient power for multiple hypotheses across several subgroups, the number of participants needed to be recruited is a complex multidimensional calculation. Hence, numerous simulations were conducted to calculate power under various plausible scenarios. The maximum target of 4500 participants was chosen from these simulations because it gave over 80% power for many of the subgroup analyses with a 1-day benefit in terms of symptoms relief from oseltamivir. Of the participants, 2500 will provide over 99% power for comparing the primary endpoint in the overall study population where there is at least a 1-day benefit of oseltamivir for participants with confirmed influenza. This number will also provide >80% power for all subgroups if there is a 2-day benefit of oseltamivir in participants with confirmed influenza. We based these simulations on the assumption that 50% of patients will have confirmed influenza and 50% of patients will have ILI originating from another viral infection. The primary analysis will be ITT and will include all randomised participants in the treatment arm they were assigned regardless of treatment taken. Secondary analyses will include the subset of the ITT population with confirmed influenza. There will be at least one interim analysis when accrual and data collection for each season is complete and before recruitment opens in the subsequent influenza season. If accrual is rapid and large numbers of patients are enrolled, for example, in the case of influenza pandemic, more than one interim analysis may be conducted during an influenza season, each occurring after approximately an additional 750 patients have been enrolled. The adaptive randomisation probabilities may be updated and arms assessed for superiority after each interim analysis. The composite primary endpoint of return to usual activities with resolution of any fever, muscle ache and headache to a minor problem or less will be modelled according to a Bayesian piece-wise exponential model. This is a survival time model that allows the baseline hazard to vary across follow-up. The hazard for reaching the primary endpoint will be modelled during four time intervals—0–2 day, 3–5 days, 6–10 days and 11 or more days. Participants not reaching the primary endpoint by 28 days (including participants that die) will be considered censored at 28 days. Participants who withdraw, are lost to follow-up or not evaluated for the primary endpoint for any reason will be considered censored at their last contact date or 28 days, whichever is earlier. Cost-effectiveness analysis will compare the direct medical costs and health outcomes (in terms of number of days where ILI limits usual activities and in terms of quality adjusted life years gained) between the different arms. The analysis will use data from the trial (resource use, EQ-5D-5L, EQ-5D-3Y and VAS scores) and other relevant data from the countries in which the trial is set (eg, unit costs and type of healthcare provided within each country). Potential differences in repeated measures (EQ-5D-5L, EQ-5D-3Y and VAS) between arms will be investigated on a per-participant basis using mixed-effects models. Valuation of quality of life (using a standardised instrument for measuring generic health status) will be done in accordance with the guidelines of the Euroqol group,35 using the ‘EQ-5D-5L Crosswalk Index Value Calculator’. Uncertainty will be explored using bootstrapping to represent clouds of incremental cost-effectiveness ratios on the cost-effectiveness plane, as well as cost-effectiveness acceptability curves. Subgroup analyses will be performed to acknowledge heterogeneity within each arm of the trial (eg, age, severity and country). Value of perfect information analysis may also be performed to identify which sources of uncertainty should be reduced through additional research to efficiently improve decision making. The ALIC4E trial will be the first large-scale, international, non-industry-sponsored, pragmatic, randomised trial of (cost-)effectiveness of adding oseltamivir to best usual primary care for people suffering from ILI. ALIC4E will be an open trial in order to approximate effects in conditions close to those of usual care in order to determine real-world estimates of (cost-) effectiveness. Open trials have been criticised because, should a treatment appear beneficial, it may not be clear if the effect resulted from biological mechanism or because of a placebo effect. When considering the possible outcomes of ALIC4E, if no benefit is found in the antiviral arm, despite the comparator usual care arm not being enhanced by the possible effects of a placebo, then prescribing the antiviral agent should not be recommended. On the other hand, if a benefit from an antiviral agent is identified in the pragmatic trial, given that the drug’s efficacy will have already been demonstrated in many placebo-controlled trials and that the drug’s mechanisms of action are known and are specific to the condition under study, then it would be obtuse to suggest that any benefit ALIC4E may identify derives from the placebo effect, and not from the antiviral’s effect on influenza. The lack of cost-effectiveness analyses alongside clinical trials, and given that children, older people and people with comorbidities are under-represented in studies that have been done, has once again been highlighted after the WHO’s decision to downgrade the status of oseltamivir.9 36 Despite the lack of trial evidence, the 2017 WHO Model List of Essential Medicines states that the use of oseltamivir should be restricted to severe illness due to confirmed or suspected influenza virus infection in critically ill hospitalised patients.10 Another report quoting the WHO states: “unless new information supporting the use in seasonal and pandemic outbreaks is provided, the next Expert Committee might consider oseltamivir for deletion”.9 The current UK and US guidelines recommend treatment of defined subgroups of frail patients and patients with increased risk for complications.6 37 Since the evidence base for these recommendations is incomplete, withholding treatment from these or other patients may possibly deny them benefit. By including a ‘best usual primary care’ arm, our study will determine the added benefit of antiviral agents over and above current practice for seasonal and potentially pandemic influenza. This information will be of great importance to the delivery of primary care for ILI, as well as enhance the evidence base around advocating self-care. In many countries, patients with ILI symptoms are advised not to consult but to self-manage, and patients with additional risk factors are seldom routinely treated with an antiviral agent. This is largely because of an absence of evidence about the cost-effectiveness overall and in subgroups of interest. The virulence, spread and type of circulating influenza strains vary from season to season. ALIC4E aims to recruit over three winter/influenza seasons in 15 countries, thereby obtaining widely applicable data allowing us to determine whether any benefit or otherwise of antiviral agents is influenced by season. Furthermore, the aim is to include a wide age-range of participants from many different settings, as well as those with comorbidities. Additionally, in the event of an influenza pandemic, or should additional intervention arms be included, a decision could be made to increase the maximum sample size. The adaptive design offers several advantages over a traditional study design. Recruitment into a particular arm can be stopped once a predetermined level of certainty about the effectiveness or non-effectiveness of treatment in that arm has reached a predefined estimated precision. Adaptive randomisation could increase the chances of participants being allocated to arms where their information will be most useful and to the intervention that is most effective for them. This can lead to better patient care and better patient outcomes as the trial progresses. Second, the platform design allows new intervention arms to be added to the trial, benefiting from comparisons with existing treatment arms in a head to head way. This flexibility extends to a potential pandemic situation where additional or alternative interventions may be added according to governmental or public health recommendations. In this way, the study will remain current and relevant to clinical practice and evolving circumstances throughout. ALIC4E will be novel in many ways. It will provide critical information about the clinical and cost-effectiveness of adding oseltamivir to best current ILI management in conditions that approximate usual care, both overall, as well as in important, prespecified subgroups. ALIC4E is likely therefore to enhance the evidence base supporting and important and common area of clinical practice. In addition to the authors, we would like to acknowledge the contribution of the other members of the 21 ALIC4E co-ordinating centres: Bohumil Seifert, Lars Bjerrum, Mike Moore, Christos Lionis, Katalin Bezzegh, Tom Fahey, Florian Nicula, Carl Llor, Heiner Bucher, Sabine de Weirdt, Jane Barnett, Nicola Blakey, Pascale Bruno, Christine Pintaric, Bernadett Kovács, Réka Pauer, Dovile Narvilaite, Nicolay Jonassen Harbin, Anna Gryko, Basia Pytel, Ania Kowalczyk, Anca Balan, Monica Groza, Patricia Fernandez-Vandellos, Carmen Rodriguez-tenreiro Sanchez, Rosa Morros, Helena Pera, Anna Garcia Sangenis, Sofia Sundvall, Filothei Voltyraki, Irene Vasilaki, Antonios Bertsias and Ioanna Tsiligianni. We also acknowledge and thank the hard work and dedication of all the networks recruitment teams, practices and local laboratories. The authors would like to acknowledge the contribution of the Trial Steering Committee members, namely Patrick Bindels, Gordon Taylor, Åke Örtqvist and Keith Shankland (patient/public representative) and the Independent Data Monitoring Committee members Deborah Ashby, Sonia Saxena and Simon Gates. Also all the members of the Patient and Public Involvement group who contributed to the study design and development. The authors would also like to acknowledge the other members of the collaborative PREPARE work packages, in particular: Nina Gobat and Micaela Gal (WP1); Mandy Kuijstermans, Pieter Moons and Veronique Nussenblatt (WP7) and Frank Leus, Joost Schotsman and Susan van Hemert (WP8). Finally, we acknowledge the help and support from the Nuffield Department of Primary Care Health Sciences and Primary Care Clinical Trials Unit, University of Oxford in particular Sonya Beecher and Julie Allen for their respective administrative and trial management support. World Health Organisation. Factsheet. http://www.who.int/mediacentre/factsheets/fs211/en/ (accessed 10 Aug 2017). Centers for Disease Control and Prevention (CDC). Estimates of deaths associated with seasonal influenza - United States, 1976-2007. MMWR Morb Mortal Wkly Rep 2010;59:1057–62. The National Institute for Health and Care Excellence. Amantadine, oseltamivir and zanamivir for the treatment of influenza. Technology appraisal guidance 2009;168 http://nice.org.uk/guidance/ta168. World Health Organization. WHO model list of essential medicines 20th list, 2017. http://www.who.int/medicines/publications/essentialmedicines/20th_EML2017_FINAL_amendedAug2017.pdf?ua=1 (accessed 08 Dec 2017). Roche Products Limited. SPC Tamiflu 30 mg, 45 mg and 75 mg Hard Capsules, 2017. https://www.medicines.org.uk/emc/medicine/20294 (accessed 10 Aug 2017).
. Neuraminidase inhibitors for preventing and treating influenza in healthy adults and children. Cochrane Database Syst Rev 2014;4:Cd008965. The Academy of Medical Sciences and Wellcome Trust. Use of neuraminidase inhibitors in influenza, October 2015. https://acmedsci.ac.uk/file-download/38069-561595082cd83.pdf (accessed 10 Aug 2017). PREPARE Consortium. Platform for European Preparedness Against (Re-) emerging Epidemics. https://www.prepare-europe.eu/ (accessed 10 Aug 2017). GRACE-LRTI Consortium. Genomics to combat Resistance against Antibiotics in Community-acquired LRTI in Europe. http://www.grace-lrti.org (accessed 10 Aug 2017). European Centre for Disease Prevention and Control. Seasonal Influenza Surveillance Reports. https://ecdc.europa.eu/en/seasonal-influenza/surveillance-reports-and-disease-data (accessed 08 Dec 2017). Official Journal of European Union. Commission implementing decision of 8 August 2012 amending Decision 2002/253/EC laying down case definitions for reporting communicable diseases to the Community network under Decision No 2119/98/EC of the European Parliament and of the Council (notified under document C(2012) 5538). 2012;16 http://eur-lex.europa.eu/legal-content/EN/TXT/PDF/?uri=CELEX:32012D0506&qid=1428573336660&from=EN#page=16.
. Canadian Acute Respiratory Illness and Flu Scale (CARIFS): development of a valid measure for childhood respiratory infections. J Clin Epidemiol 2000;53:793–9. EuroQol Research Foundation. EuroQol EQ-5D. https://euroqol.org/euroqol/2017 (accessed 27 Nov 2017).
. Antiviral agents for the treatment and chemoprophylaxis of influenza–recommendations of the Advisory Committee on Immunization Practices (ACIP). MMWR Recomm Rep 2011;60:1–24. ↵ i Heart disease/diabetes/chronic respiratory condition (eg, asthma, chronic obstructive pulmonary disease)/hepatic, hematological, neurological or neurodevelopmental condition/stroke or transient ischaemic attack/overnight hospital admission in the last year. ↵ ii Rhinovirus, coronavirus (NL63/229E/OC43/HKU1), parainfluenza (1, 2, 3, 4), human metapneumovirus A/B, bocavirus, respiratory syncytial viruses A/B, adenovirus, enterovirus, parechovirus. ↵ i Mycoplasma pneumoniae, Chlamydia pneumoniae, Streptococcus pneumoniae, Haemophilus influenzae type B, Staphylococcus aureus. EB and AWV contributed equally. Contributors CCB and TV are cochief investigators of this trial, act as guarantors of the study in its entirety and led the development of the research question, study design and obtaining the funding along with AWvdV, JC, PB, HG, MdJ and PL. EB, JC and AWvdV manage the trial and coordinate the operational delivery of the study protocol to the networks co-ordinating centres. BS and JH are the trial statisticians. PB provides health economics input. MI provides support with sampling and analysis. RMA, CB, SCh, SCo, AC, MD, MDP, ADS, NAF, DG, MG-ć, ML, FMT, AM, JP, MP, RR-J, P-DS, AT, PT and DV are representatives of the collaborating co-ordinating centres responsible for their networks participation in the trial. EB and AWvdV drafted the manuscript and supervised by CCB. All other authors provided critical review and final approval of the manuscript. Funding This work was supported by the European Commission FP7 Programme grant no HEALTH-F3-2013-602525.